My mother-in-law qualifies to be a Scot. She loves her whisky! Whereas a shot of whisky would put me under the table, as far as mum-in-law is concerned, it has the opposite effect, it perks her up! She of course is correct in her reaction as “uisge beatha”, which is whisky in Gaelic, means water of life. Whisky is Scotland’s national drink, and uisge beatha (pronounced oosh-ga beh-huh – a swig of whisky might help here) has been produced in this country for longer than any sober Scot can remember. It’s amazing to think that it all began centuries ago as a way of using up rain-soaked barley after a wet harvest. The whisky industry is now one of the country’s biggest source of revenue, bringing in hundreds of millions of pounds every year. On sightseeing tours of Scotland, a stop at one of the whisky distilleries is a regular part of the tour itinerary and on ours, we visited Scotland’s smallest distillery – Edradour, a single malt Highland distillery. But before you dash out to taste this water of life, it’s useful to understand some basics about Scotland’s national drink. Scotland produces three types of whisky – malt, grain and blended – which are produced and distilled differently. Within malt whisky alone, there are different types such as Single malts, cask malts and vatted malts. The heavy weights in Single malts include names like Glenmorangie, Glenfiddich and Macallan. Lowland – These whiskies are produced in the southern half of Scotland, below the Highland Line. Whiskies from the Lowlands are mellower and gentler than those from the north and much of the production ends up in blends. Highland – The Highland is home to some of the most famous brands and whiskies here range from mellow and sweet to aromatic and flowery. If you intend visiting lots of distilleries, the Highlands is the place to come to. In Speyside alone, there are more than 40 distilleries, several of these in the Spey Valley are on the Whisky Trail. Campbeltown – was once Scotland’s most famous whisky town. But, the more than 20 distilleries in the 19th century has dwindled to only two – Springbank and Glen Scotia. A new one, Glengyle-Distillery, opened in 2004. Whiskies in Campbeltown are more distinctive than those of the Lowlands. 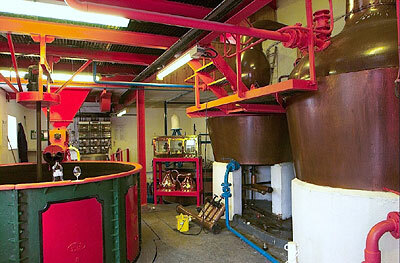 Islay – has the most distinctively flavoured whiskies. “Peat reek” is Islay’s secret weapon. Apparently there’s endless supplies of peat here which are used in the malt kilns. The peat reek gives Islay’s whiskies a smell and taste which are described as ‘iodine’, ‘seawater’ and even ‘kippers’ – not quite as elegant as wine descriptions such as “aromatic, buttery flavour with a hint of spice and gooseberry”. Islands – refer to places from Arran, Jura, Mull and Skye in the west to Orkney in the north. The whisky flavours here are as wide-ranging as any in the Highland group. In 2007, 16 distilleries from Arran to Skye joined forces under the umbrella of ‘The Whisky Coast’. In this group you’ll find famous names like Laphroaig, Ben Nevis, Bowmore, etc. Whisky tasting is done primarily through the nose which is supposed to be a far more acute organ than the tongue. Then as you swallow the whisky sample, the taste and smell sensation interact to create the whisky experience. There are only four primary tastes compared to 32 primary smells. If you’re a whisky novice, be careful when smelling a full strength whisky as the pungency in a very strong spirit could sting your nose.